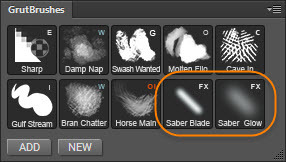 Q: How do I install the Lightsaber Photoshop Brushes? This PDF is included the zip file and has detailed instructions. 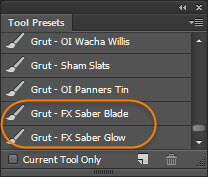 But…If you have Photoshop CC 2014 or 2015 you may want to install the free GrutBrushes Artist’s Toolset Panel plugin first (you can download it from your account page after you checkout) and then install the brushes into the GrutBrushes panel but they work just as well without it. Where do I find the LightSaber brushes in Photoshop? How do I add Lightsabers to my photos? Holding down shift (to draw a straight line) Click once at the starting point and then at the ending point. How do I get more GrutBrushes Photoshop brushes? Still want even more Free Photoshop Brushes? There’s another free Photoshop brush available on the the free Photoshop brush of the week page (a new one every week!) That’s 52 free Photoshop brushes per year. – Only install the TPL files. Don’t drag the PNG or PDF files into Photoshop. – You can also try dragging the TPL files onto the Photoshop app icon. – You can also try double clicking on the tpl file and if Photoshop is properly configured it should install into your Tool Presets panel. Hmmm. It should load in CS5.5 and up. Did you get an error message that you can share? Wouldn’t load in CS6. Is there a minimum version on this tool preset?